There are two phone numbers I remember from my childhood – my parents number and the number for the Staveley Fish Supply & Hamburger Bar … 342 7468. As a child, this was always our favourite place to get takeaways, the burgers were amazing! Fast forward a few years and the place has changed owners and we are now vegetarian. We have been on a hunt more recently to confirm that the “oil” used at the local burger bars is actually vegetarian. It turns out that many are using imported beef tallow. So if you are vegetarian, make sure you check. Staveley Fish Supply is using vegetarian based oil. 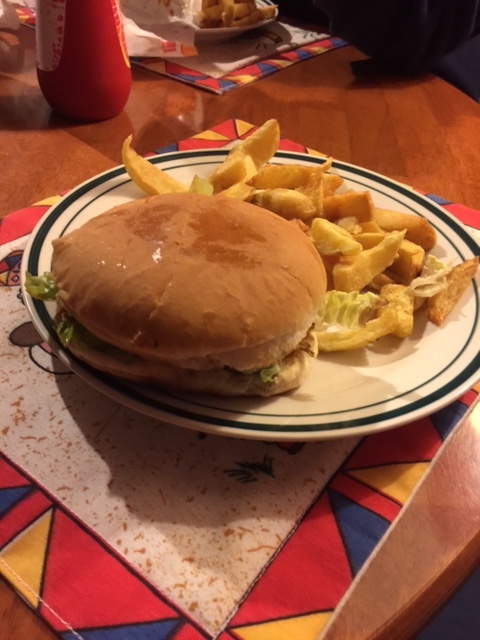 I can’t swear to the country of origin, or how environmentally friendly it is (suspect its Palm Oil) but we decided to give them a try for their vegetarian burgers. The burgers were a surprise, we had been here a few years back and not liked their vegetarian burgers. Perhaps we hit a bad day, or they have changed owners again, but the burgers more recently have been good (we had to double and triple check). They are a bit sloppy as they use a fair bit of sauce, but the large slices of field mushrooms and the pineapple rings are nice additions. The lettuce and tomato are freshly sliced and the bread rolls are soft. The chips are also excellent, crisp on the outside and soft in the middle. They are also generous servings. Total for two vegetarian burgers and a scoop of chips is less than $15. My partner also likes the potato fritters – essentially a slice of potato, battered and deep-fried. Tasty but not good for those watching their weight or cholesterol. Also this is takeaway only, there is nowhere to dine in. There are a lot of parks in the area though so that would be a good option if you didn’t want to take it home. Would we come back here again? Yes, its cheap and quick but as always with these types of meals, my partner is much more of a fan than I am. Would we order the same dishes again? Yes, nothing else really appeals on the menu as vegetarian choices are limited. Would we try something else? As above, limited choices. 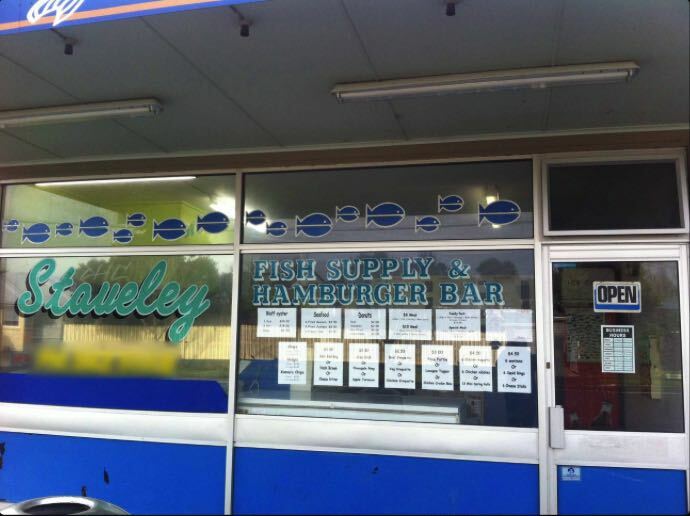 Would we recommend Staveley Fish Supply & Hamburger Bar? Yes I think so, they have a good menu and its a popular place with lots of locals getting their meals so the food is being prepared fresh to order.